We stock a wide selection of hand shakers from around the world. 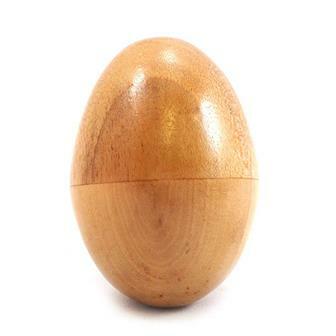 From Bali we have a great choice of round and egg shaped shakers, seed based percussion and tambourines. From India, a selection of traditional shakers and from Kenya a few great sounding Kyambas. 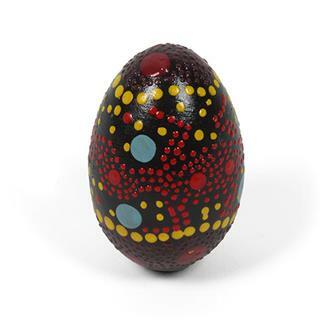 These simple but attractive wooden egg shakers each have a colourful tie dye marbled patterning. 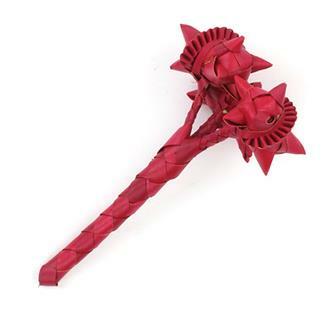 Fits snugly in the hand and makes a fantastic crisp sound. 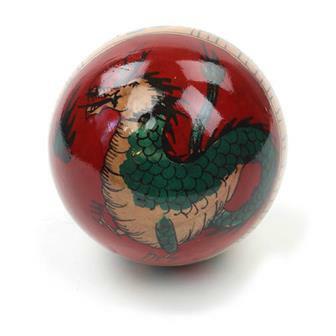 These brilliant egg shakers have a fantastic, crisp sound and each features wonderful handpainted decoration. 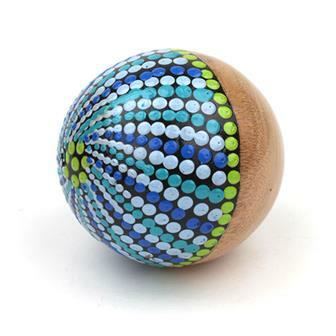 Simple percussive round ball shaker, with dot painted design that will vary from item to item. 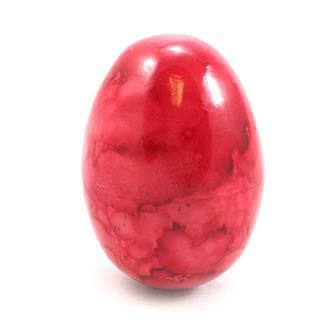 Contains small beads that produce a high pitched 'cha cha' sound. Fits neatly in the palm of the hand. 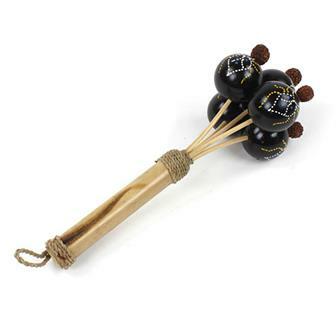 Simple decorative percussion instrument this wooden ball is filled full of small beads and produces a crisp "chichi" sound. 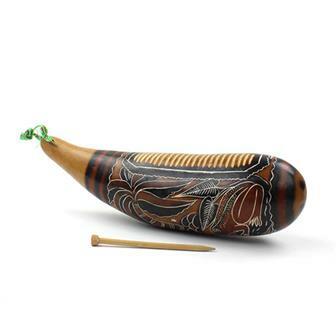 These amazing shakers are made from large seed husks that are a by product from Indonesian cuisine. The seeds are suspended on a chunky twine loop. The seed husks make a lovely full crunchy noise when shaken. 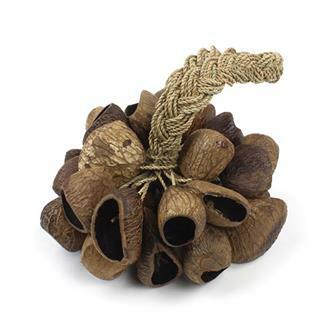 These great shakers are made from large hollow seeds fixed onto a ring of beaded elastic. 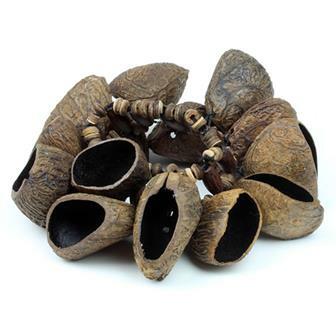 The seeds can be worn on the wrist or ankles and are perfect for wearing whilst dancing, adding extra definition to the accompanying music. 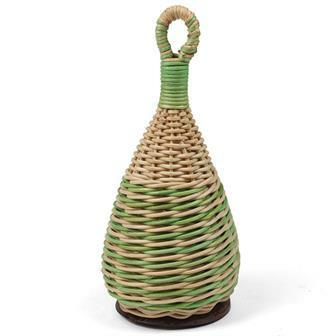 This large upcycled shaker is made from seed husks left over from Indonesian cuisine! The seeds are suspended on chunky twine and attached to a sturdy bamboo handle. The bamboo handle is then finished with a 'burnt etching' design. Makes a lovely full crunchy noise when shaken. 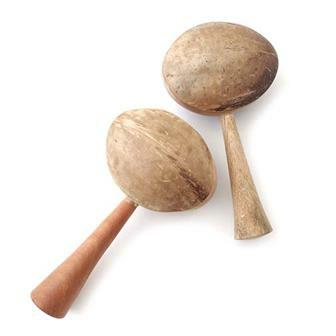 These traditional African shakers scrapers are made using basic materials to produce a great sound. 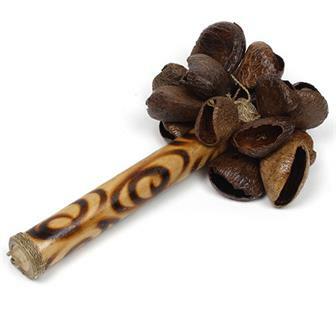 Used in Kenyan dances, they have hand grips on either side and can create a variety of sounds by changing the style and direction of shaking. These fascinating shakers are cleverly made from strips of flat straw woven together to form these amazing, three headed shakers. Each head is filled with gravel and the shaker produce a subtly pleasing, gentle sound. 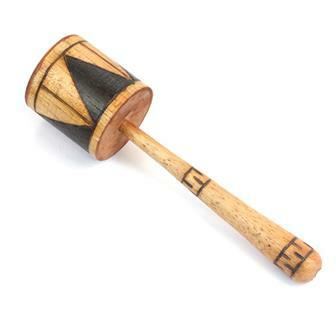 Named after the Swahili word for noise, kelele shakers are made with a simple, gravel filled wooden barrel on a stick. 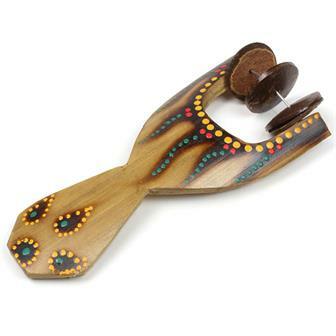 They make a highly effective rattle and they produce a wonderfully crisp, high pitched "cha-cha" sound. 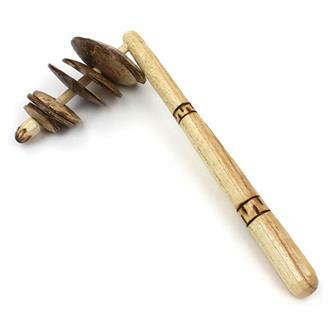 Wonderfully clackerty percussive instrument from Indonesia. 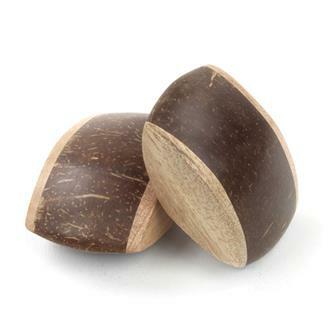 These simple angled shakers have progressively sized coconut 'coins' that make a great loud noise when they come in contact with each other. 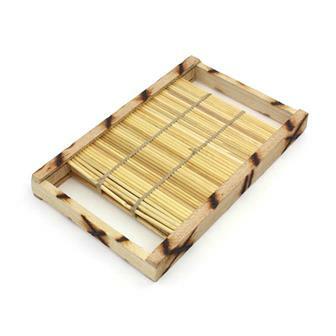 Great for adding rustic, natural textures to percussion sections. 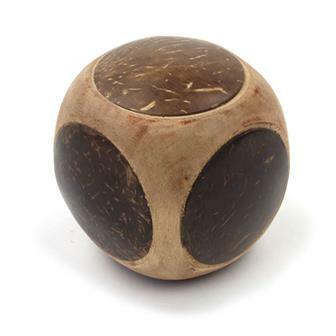 Made from a piece of very large bamboo with coconut discs suspended along a wire bar. This simple but effective shaker makes a great noise. These very popular shakers are made from five decorated balls filled with tiny beads that create an excellent crisp, brightly coloured tone. 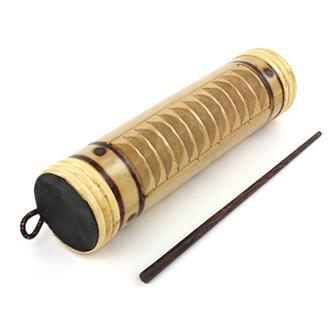 The sturdy bamboo handle can be held and played like a drum stick, sounds even better with one in each hand.